The best-selling team of chef Chris Schlesinger and Cook's Illustrated executive editor John Willoughby present a radically simple method of applying flavor boosters to ingredients hot off the grill, maximizing flavor and dramatically reducing grilling time over traditional marinades. Coat ingredients with spice rubs before grilling for stronger, better-defined flavors than traditional marinades (and the rubs can be made and applied in the time it takes for the grill to heat up). When your fire is ready, simply grill according to the super-basic recipes. Toss just-grilled items with vibrant ingredients—citrus, hoisin, fish sauce, ginger, basil, fresh chiles—to take the flavor to another level. Bursting with the bold flavors of spices and condiments from around the world, these 130-plus recipes will set your taste buds on fire and have your friends clamoring for more. CHRIS SCHLESINGER is the former owner and chef of East Coast Grill in Boston. He was the winner of the 1996 James Beard Award for Best Chef: Northeast and is a contributing editor for Saveur. He lives in Cambridge, Massachusetts. JOHN WILLOUGHBY is a writer, editor, and the former executive editor at Gourmet; he currently serves as the editorial director for magazines at America’s Test Kitchen and publisher of Cooks’ Illustrated magazine. He was the co-author, with Chris Schlesinger, of a monthly feature in the New York Times food section. He lives in Cambridge, Massachusetts. Schlesinger and Willoughby have written nine cookbooks together. 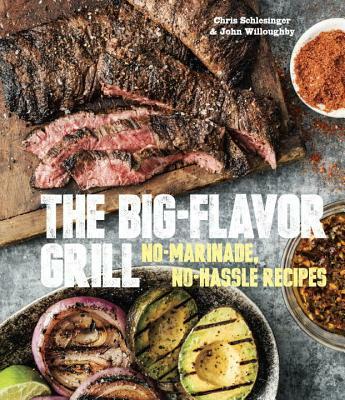 "Chris Schlesinger and John Willoughby's Big Flavor Grill will probably transform the way you think about grilling. The pair abandoned the notion that long marinating times are necessary for tender meat and bold flavor, instead opting for zesty, piquant rubs and sauces that save our time and our sanity. This concept is enough to catapult the book to weekday-friendly use all summer long."